As was the practice of several guitar manufacturers like Martin, Gibson and Guild, pickguards were glued directly to the raw wood prior to painting. Removal of those pickguards reveal a bare, unfinished top beneath that must be sealed prior to replacement. When these celluloid pickguards shrink they tend to curl into the shape of a potato chip. If the pickguard manages to keep a fairly good grip on the top and severe shrinking occurs cracks can develop on either side. Most of these pickguards come off with very little effort. However, care must be taken to insure the guard does not pull up spruce splinters as it is separated from the top. Because these guards are usually highly flammable, caution is necessary when using heat. Ordinarily I am able to simply peel these away from the top. When removing the guard be sure to watch for lifting splinters and peel the guard off in the best direction to avoid grain run out. 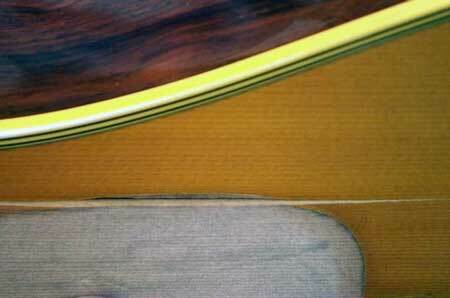 When cracks occur some are nearly undetectable until the shrunken pickguard is removed. Very large cracks generally develop only if the instrument is not properly humidified or has been stored unmonitored for a long period of time. Instruments that are dry increase the severity of the issue and should be properly humidified to prevent further damage. Severe cracks that have left the top uneven can be cleated to flatten the top or reinforce the split. After any cracks are repaired the bare wood area is finished with lacquer and leveled with the surrounding finish. Lacquer is quite high in solvents and as a result it shrinks quite a bit. Multiple coats are necessary to build the area up and level it with the surrounding finish. This finish is applied by brush for a quicker build up and then sanded flush. After wet sanding I take the instrument to the machine buffer to polish the top and install a new pickguard. When the original pickguard was covered with lacquer their replacements do not match the originals exactly, however, due to the nasty contortion and severe shrinking it is rare that they can be re-used. 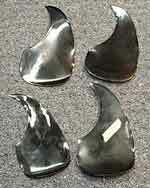 While attempts have been made to flatten and re-adhere these guards I have seen several return to their prior condition. 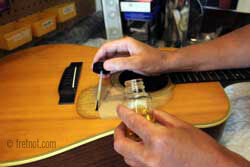 If you are attempting to re-use a warped pickguard simply be aware that you may not experience a permanent repair. I am also apprehensive about using wood glue to re-adhere these to bare wood as future removal could result in damage to the top. Pickguards are made by hand when a suitable size and shape is not available or when a unique material is desired. Many online pickguard suppliers now offer to make a replacement guard for you using their templates or a tracing of your original when a template is not available. Ready made pickguards are available in popular sizes and an assortment of colors, far more colors than were once available. Most are packed with double sided tape for a peel and stick application. View pickguard removal instructions here.